Newcastle Falcons cruised to a convincing win over bottom club London Welsh in difficult conditions. The hosts led 24-7 at the break thanks to tries from Sinoti Sinoti, Rob Vickers, Mike Blair and Will Welch, while Nick Scott replied. Ally Hogg went over after the interval to extend Newcastle's lead before Tom Catterick scored in the corner. London Welsh have lost all 13 of their Premiership matches this season. 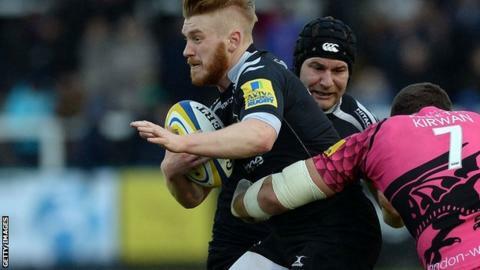 The Falcons scored six tries - and had the try-scoring bonus point wrapped up by half-time - as they registered their biggest Aviva Premiership win for eight years. Sinoti put the hosts in front after with Hogg picked up from the base of the scrum and flicked the ball out to him. Newcastle were quickly back on the attack when Welsh failed to clear a long kick and then conceded a penalty which the Falcons put in the corner and drove prop Vickers over for a try converted by Catterick. The third try in seven minutes followed when Sinoti blasted through and passed inside overhead for Mark Wilson to send in Blair and Catterick again converted for 19-0. Scott briefly raised Welsh hopes by brilliantly snapping up Robinson's clever dink down the touchline to score, and Robinson landed the extras for 19-7 in 24th minute. However, Newcastle's superiority in the rolling maul was demonstrated again when Welch was driven over for a try in the 33rd minute to give the Falcons a 24-7 half-time lead and the try-scoring bonus point. Much as they had done in the first half, Welsh started the second period well but failed to make it count and they again paid the price. Hogg took a pass from Juan Pablo Socino and galloped 50 yards up the touchline, bumping off Scott and Olly Barkley for a try which Catterick converted in the 55th minute for 31-7. Both sides made use of their benches in the second half and the continuity went right out of the game - particularly in Newcastle's case, but Welsh were unable to profit, and their frustration was never more evident than when Tom May had a chance to score only for the ball to be passed behind him and straight into touch. That ruined the chance of a try-scoring homecoming to the club he started his career with 19 years ago, and on his last appearance here after announcing his retirement at the end of the season. With three minutes left George McGuigan snapped up a loose ball and Alex Tuilagi slipped it to Catterick, who scored with an outside run and converted his own try for 38-7. "I thought we were pretty accurate today. "We played with the wind in the first half and got four tries and leaked one - which was disappointing - although it was well-executed by them and then in the second half played into a howling gale but the boys were pretty sharp actually and the accuracy of the kicking was pretty good. "We started out probably being a bit too ambitious in the line-out but once we sorted it out and settled down it went pretty well and the lads chose the right options." "Perhaps the most frustrating thing is that we didn't make Newcastle work too hard for their tries. "We were pretty soft at times in defence and we kept turning over possession and giving them field position and from that they scored pretty easily. "When you're four tries down after half and hour, you know you're pretty much up against it. There were a couple of positive aspect in our attacking play but we didn't retain possession enough and made it easy for Newcastle." Newcastle Falcons: Hammersley; Sinoti, Powell, Socino, Tait; Catterick, Blair; Vickers, Lawson, Brookes; Green, Furno; Wilson, Welch (capt), Hogg. Replacements: McGuigan, Fry, Orlandi, Thompson, Mayhew, Tipuna, Harris, Tuilagi. London Welsh: Robinson; Kear, May (capt), Jewell, Scott; Weepu, Rowley; Trevett, Britton, Vea; West, Down; Browne, Kirwan, Fonua. Replacements: Morris, Reeves, Cooper, Thorpe, Pienaar, Lewis, Barkley, Stegmann.